This was our third visit to Koutouloufari in Crete. It is perfect for getting away and chilling out. We spent time reading by the pool, up in the Lassithi Plateau, exploring ruins and I even went a boat out to Spinalonga Island. Just what I needed. One of the reasons we keep going back to Crete is the food. The village is only really two streets, each full of tavernas and bars. The food ranges from ok to brilliant, but it’s never bad. 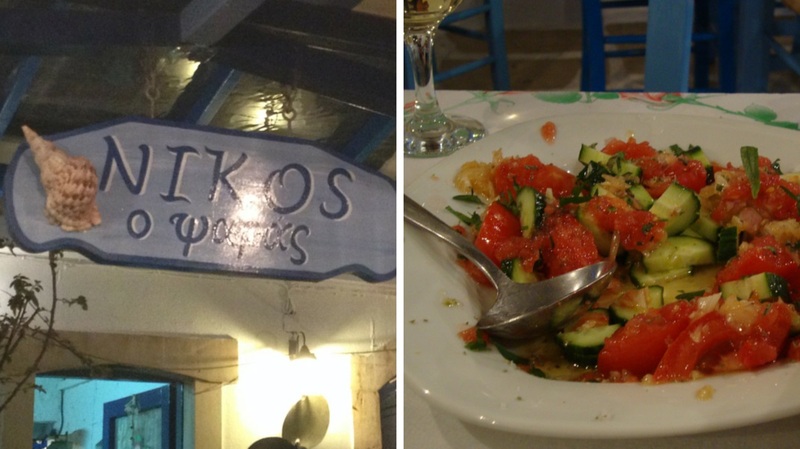 On our last visits two restaurants stood out: Emmanuel’s (which wasn’t open when we went) and Nikos the Fisherman. The welcome we got at Nikos was amazing. Nikos is indeed a fisherman. His wife does the cooking. His daughter was serving this year, but their son was around as well. Crete is a friendly place but here that goes above and beyond. When we walked in we were greeted by the daughter (who I think is called Sylvia). ‘You’ve been here before- welcome back.’ Nice, but I am sure that they get many repeat visits. Then she said, ‘Yes, not last year, the year before.’ Bingo! She gave me a hug and kiss like an old friend. 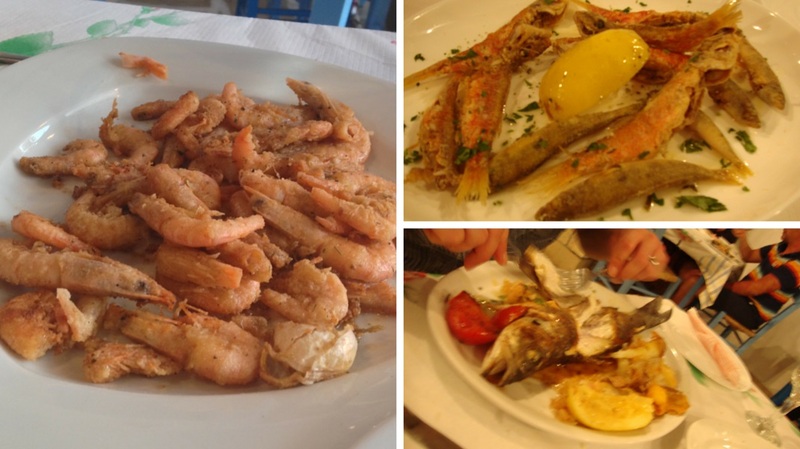 The food at Nikos the Fishman is fresh and simple – if you want seafood in the village it is the place to go. With bread we were given tiny olives from their trees and delicious anchovies. The salad was the best we had – it had minced shallots and had been left to marinade in the dressing. Lightly fried prawns were a stand out starter, and everything we had for mains were mega: a plate of small red snapper, sea bass, bream. On our second trip we left with more hugs and kisses and a gift from her mum – a Nutella jar full of soaked raisins. I don’t know what they were soaked in, either honey or booze, but they were super sweet and I gobbled them up with Greek yoghurt before we left as I couldn’t get them through in my hand luggage. Such as shame as I would have loved to have baked with them. But so thoughtful. A must visit if you’re in the area. They don’t have a website but I have found them on Facebook here. An interesting meal in the village this time was at Galini. This place is always busy, but we’ve never been in on past visits because, to be honest, it looks like the Trafford Centre! If you’ve never been to the Trafford Centre let me paint you a picture: faux Greek pillars, naff friezes on the walls… but you don’t need this in Greece. Oh and the ladies waiting the tables were in togas. Why?! So you can see why we always gave it a wide birth! We decided to stop being snobs and give it a go. The food all had a slightly retro feel. I’d asked for a crab and avocado starter, but was talked into having prawns instead. 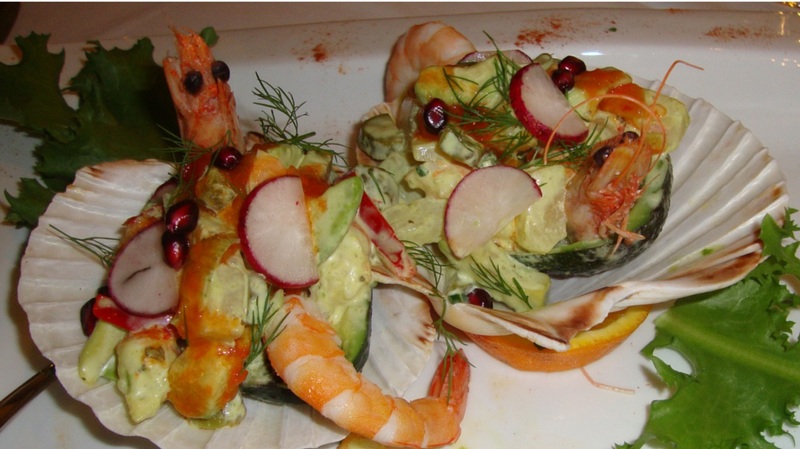 The prawns were huge and the avocado was mixed with a really zingy citrus dressing. A small lobster for the main course was spoiled by being covered in cheese, as I said very retro, but the meat underneath was lovely and tasty. Galini also has the funniest loo in the village! It’s like something space aged where you press a button, there is an almighty noise and a plastic seat cover is replaced for your convenience (and, er, sweaty bum!). This was a set meal and really good value- but I’m afraid I can’t separate the naff theatricals from the food so not my cup of tea overall. For drinks, Cafe Greco is good and on our last day we had breakfast at Koutouloufari Bakery. Run by a Dutch couple the coffee was (apparently) very good and there was a wide range of breakfast foods and some lovely looking home made cakes. I wish we’d gone more often. If you are self catering the small shops in the village have bakeries attached. If you go for the ‘village bread’ for about one euro a loaf, it is covered in sesame seeds and slightly yellow in colour- maybe made with some cornmeal. It is lovely fresh. 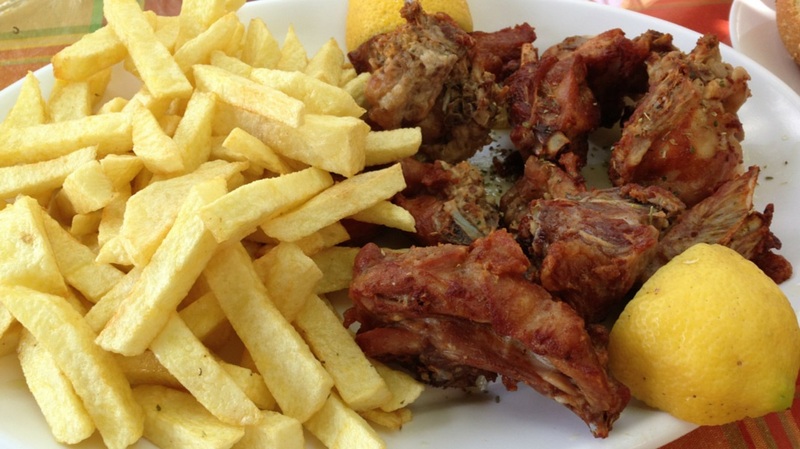 Outside of Koutouloufari we had a couple of outstanding meals in roadside tavernas. Spanis Taverna is on the road in the Lassithi Plateau – between the homosapien museum (worse museum ever, but great walk from the car park up the hill) and Zeus’s cave (really). We went on our last trip, so decided to revisit it when we were in the area. When we pulled up in the car, we could smell the wood fired oven. 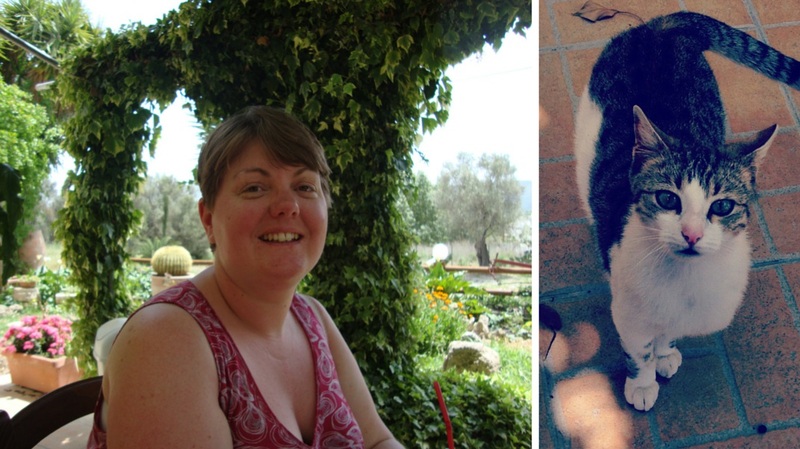 We chose a seat in the shade as it was starting to get hot and both chose pork – me kebabs and Andrew meatballs. You see these wood burning ovens in almost every place which serves food and it really is the best way to cook meat. All tender on the inside, crispy bits and smoky flavour. We also pulled into Taverna Agios Ioannis on the road to Matala. The menu told us that the rabbit was the house special they grow their own veg and make their own olive oil. So rabbit it was! Cooked in the wood oven, it was the tastiest finger food ever. The resident cats were happy too as they got some titbits. I think this was the meal of the holiday for me. It’s also worth picking up strawberries from the roadside sellers. Big, juicy and full of flavour they’re a million miles away from the ones you buy in the supermarkets here. There’s loads of accommodation in the village – all built into the side of the hill so all on a slope – important to know if you struggle with hills. We’ve stayed each time at the Marni Village complex. 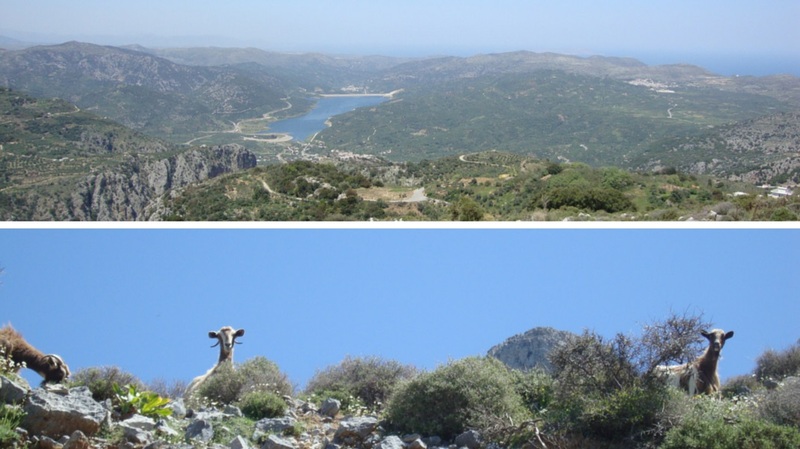 Three minutes walk from the village, it is a mix of apartments and studios with stunning gardens and views over Hersonnisos one way and the mountains the other. There are three pools and a bar, and it is ridiculously good value. We got a large one bed apartment for about £27 a night. When we were two hours late arriving because of a stupid malfunctioning sat nav (its only 30 mins from the airport) they simply left a note on the window at reception and left the key in the door. We’ll most definitely go back there and would recommend to anyone looking to stay in that area. We’ve decided that on our next trip to Crete we really need to go to the other end of the island –to the west. So if anyone has any tips, we’d love to hear them!